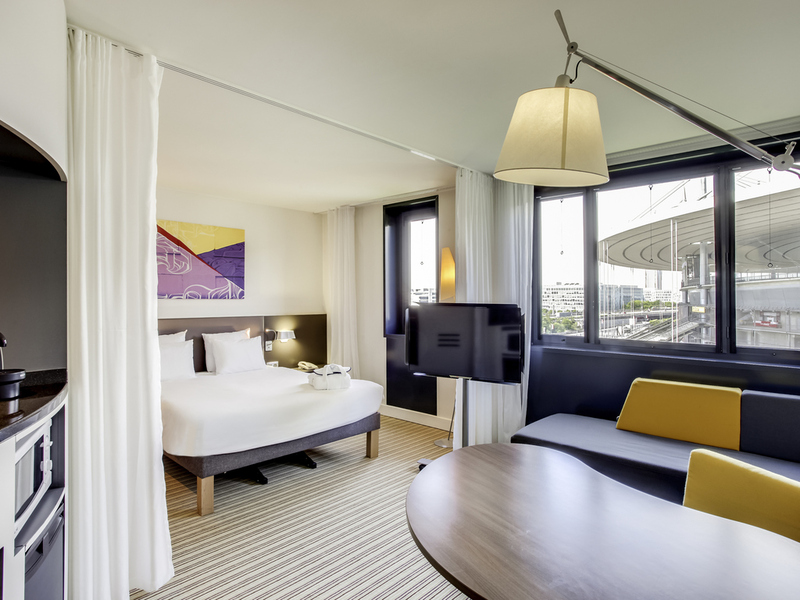 A stone's throw from the Stade de France, stay at the Novotel Suites Paris Stade de France hotel. In the heart of the Plaine Saint-Denis business district (TV studios, Cité du Cinéma etc.) and less than 10 minutes from the center of Paris, our 4-star hotel boasts spacious, modern Suites measuring 323 sq. ft. (30 m²) with fiber-optic Internet and a free TV package (Canal+, beIN, etc.). Close to Villepinte exhibition center and Charles de Gaulle Airport, Novotel Suites is the perfect base for your trip. 방이 크고 좋습니다. 다만 조금 춥습니다. 넓고 깨끗한 방입니다. 책상, 테이블이 널찍해서 일 하기에도 편했음. 주변에 레스토랑, 바, 맥도날드도 가깝고. 시내를 가기엔 좀 멀지만요.